Yep! 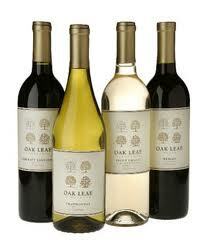 Oak Leaf Wine is only $1.97 a bottle at Wal-Mart! How in the world can a $1.97 bottle of Oak Leaf Wine from Wal-mart be any good? I opened up a bottle of Oak Leaf Wine (Chardonnay) while thinking the same thing. But, ya know what? It really wasn’t that bad. I mean it wasn’t fantastic, but it wasn’t terrible either. It was inevitable that Wal-mart would begin selling wine, because the size of the market is too tempting to ignore. With more than 4,000 stores in the United States, including Sam’s Club and other entities, Wal-mart opened the way for massive Oak Leaf sales. According to WineBusiness.com, using statistics furnished by The Neilson Company, in 2007 wine accounted for $3.5 billion in sales. Now that’s a lot of wine! Oak Leaf Wine is the private label non-vintage wine marketed by The Wine Group (the box wine people) only sold to Wal-mart stores. It is just one of the labels produced in The Wine Group’s Ripon, California production facility. Headquartered in San Francisco (about 70 miles west of Ripon), The Wine Group’s labels include such well known brands as Corbett Canyon, Inglenook, Mogen David, Franzia, Almaden and Glen Ellen wines. The firm recently relocated their operations center from San Francisco to Livermore, California, about mid-way between San Francisco and Ripon. The Wine Group was once part of the Coca-Cola Bottling Company of New York. Its operation and products are kept pretty much secret. It doesn’t even have a corporate website, although it does have brand-related sites. They are the second largest wine producers in California (more than 40 million cases produced annually) second only to Gallo. 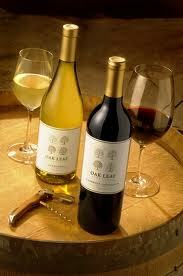 Oak Leaf Wine comes in six varietals: Cabernet Sauvignon, Merlot, Syrah, Chardonnay, Pinot Grigio and White Zinfandel. The standard 750ml bottles have an elegant label that shows four seasonal oak trees, one for spring, summer, fall and winter. You’ve probably heard of, if not tasted, Charles Shaw wine. Its Trader Joe’s wine warmly nicknamed, "Two Buck Chuck" which sells for $2.99 a bottle. Due to transportation charges to outlying states, the price can be a dollar more than California. Oak Leaf Vineyards won a gold medal at the prestigious Florida State International Wine Competition and Silver and Bronze at the 2008 San Francisco Wine Competition. Now that’s pretty impressive for a $2 bottle of wine! Most “wine snobs” will turn their noses up at this wine because it is inexpensive and comes from Wal-mart. But the fact is that it is better than one would expect. I’ve had $20 - $25 bottles of wine that could not hold up to these. For a cheap wine it’s perfect for an everyday wine to compliment dinner or snacks on the patio. I do have to say though, if this is your first glass of wine for the evening it’s not that bad, but if you’ve already had something else first and then try this wine, it will probably not taste that great. I think Charles Shaw is a better cheap wine. I’m just sayin! Ultimately, for the price, I think it’s tough to beat the value this wine delivers. So go ahead, buy cheap wine but tell your friends that is was really expensive. Chances are they will never know the difference! The California Wine Club - Handcrafted, Quality Wines from "Mom & Pop" Wineries. No Bulk Wine.